The morning of Saturday August 1st I woke with a nervous feeling that consumed me. There wasn’t anything wrong, as a matter of fact everything was alright. You see I was about to embark on a journey into unknown territory. It’s been a while since I’ve traveled to a place that I’ve never been before, a place where I didn’t speak the language and a place where I didn’t know anyone apart from the one person who invited me along. So you can imagine how strong it was, that nervous feeling that consumed me. I rose out of bed soon after the alarm sounded and while my wife prepared my breakfast and a sandwich for me to take a long I showered and got dressed. After having breakfast and some last minute packing I packed the car and said goodbye to my children and off we went to the airport. Flight went well apart from the usual airport drama but it all turned out in my favor in the end with a free upgrade and a free checked bag so I couldn’t complain. As we taxied away from the gate at JFK my nervousness began to fade away and I became curious as to how I would be accepted by the locals and what was in store for me on this week long journey. After leaving the airport we stopped at an outdoor market to pick up some fruits and vegetables that would get us through some of the week. We then stopped by a supermarket to pick up a little something to hold us over until lunch and a few more things for the house. As we drove around Port Au Prince Margarett and I spoke about plans for the week, what her vision was for the camp and we also spoke politics and the reality of what a majority of people in Haiti live day to day. We drove for close to two hours before we made a pit stop at a cozy little beach resort off the main road, a place where Margarett was familiar and is friends with the owners. We had lunch and spoke some more. I took in the view and the tranquility with warning that where we were headed there would be no such view. After lunch we hit the road to finish the final leg of our journey. Close to an hour we exited off the main road and onto an unpaved stretch that would lead us to our final destination. I guess at this point you can say reality set in. Not that I expected a four lane highway or even a two lane highway but at least some asphalt or concrete but what was I thinking. Along this stretch of road which took us about twenty five minutes to navigate it was almost like playing a video game where you had to dodge potholes, people, cows, goats, you know the usual obstacles in the road. Even with adding a little humor, it’s a sad reality. As we navigated the unpaved terrain to either side was rice paddies as far as the eye can see. Where there were breaks in the farmland shanty towns took their place. There were people walking alongside the road, some with their children, some carrying heavy loads. There were folks sitting around in groups conversing peering into the car as we drove by. Motorcycle taxis whizzed by us without a care in the world. Occasionally you would see piles of stone and gravel which indicated promised improvement, after all it was election time. As we turned off one unpaved road to another, this one leading into the small village of Grandbois was even worse than the road we turned off from. In an attempt to improve the roadway, Margarett and her family laid stones in the road bed to create some stability when driving. We ventured slowly up the road which narrowed along the way and then opened up into a cul de sac where children were playing in the mud, some clothed and some naked. Pierre who did an amazing job of getting us to our destination. He got out to open the gate and we drove around to the back where we all breathed a sigh of relief. There is no electricity in the area and the generator is used to power the house. After arriving, Pierre gassed the generator and fired it up. We unpacked the car and after a tour of the accommodations I got settled in my room. Relieved to have made the journey thus far I anxiously awaited to see what the week would hold so after settling in we began to take a look at the supplies Margarett had on hand and began to devise a plan for the coming week. We sat and spoke and planned and planned some more and the day’s journey began to slowly creep up on me. Sleep was calling me and around 10p we, well let me rephrase that, I called it a night. I showered and laid my head to rest. On Sunday, I woke after a goodnight’s sleep, freshened up and had breakfast, a routine that would become my morning ritual for the rest of my stay. We had plans to venture out to see a few things and also have lunch in Gonaives. We still had a lot of prepping to do for the week long camp and got a few things out the way before we ventured out. Prior to loading up the car, I took a brief walk outside the gate and into the cul de sac where the locals were out and about, children played, some adults went about their Sunday business and others just lounged around. I decided to be a little adventurous and began to walk around the village to get a sense of my surroundings and also get a few pictures to document my journey. After walking about one hundred yards along a narrow muddy path I amassed a following of some locals with peaked curiosity. They smiled when I turned to greet them and I snapped a quick picture. Laughter filled the air after I showed them what the picture looked like. I took a few more pictures of my surroundings and decided to head back to the house. By the time I got back in the yard everyone was ready to go and we went on our way down the bumpy road. Along the way we stopped at the clinic which services the town from a medical standpoint and also keeps their gates open so that the residents can have access to the only well within reasonable walking distance. There was a young lady pumping away when we arrived and had her children on hand to help. Even the youngest at about 3 years old had her own little water jug to carry along. We carried on along our way turning onto the other unpaved road that would lead us out onto the main road. As we drove and tried to keep our senses with all the bumps and rattling and side to side all I could think is why does it have to be like this? Roads, houses, electricity, water, food——is that too much to ask? Along the way, Margarett pointed out some of the accessible hand pump wells along the roadside and also the three schools which were spaced out along the span of the road. The schools were a long distance away from the village and I could only imagine the walk for the children especially the younger ones. We eventually made it out to the main road into the town of Marchand, Dessalines where we visited the site where Jean Jacques Dessalines once lived. Dessalines was the leader of the Haitian Revolution and the first ruler of an independent Haiti. After taking our little tour we set out for Gonaives, north of Dessalines. Gonaives is known as Haiti’s “City Of Independence” because it was there that Jean Jacques Dessalines declared Haiti independent from France in 1804. Gonaives has seen its share of death and destruction within recent years with substantial rioting and violence in February 2004, Hurricane Jeanne in September 2004 and four years later with Hurricane Hanna which claimed the lives of approximately 529 people and displacing at least 48,000 more. Driving into the town was a familiar scene of roadside markets and people everywhere. As we entered the center of town there stood a huge white church that seemed out of place amongst the smaller buildings. The town square was closed but street vendors lined the outside of the gates. We made our way to Margarett’s sister who owns a car wash service in town where we picked up some more supplies for the week. A few doors down we had lunch and then headed back to the house. The sightseeing adventure was over and it was time to get down to business. We began to sort through all of the supplies and setting the stage for the week’s activities. There were toys, coloring books, crayons, pencils, games, you name it Margarett had it covered. From the looks of things, camp was going to be a great experience for the kids. They were being afforded the opportunity to learn and play. Once we had things sorted, I showered and went to bed. Margarett stayed up as she did every night to make sure all the details were covered and everything was in place. Monday morning came and I awoke with probably as much excitement as the kids. It was here! The first day of camp. I went through my morning ritual and as I walked around the house the stage was set. I know it wasn’t by magic but everything was in its place and waiting for the most important element, the kids. Margarett and a few of the older kids made sure all the chairs and tables were put in place and all the supplies that were necessary to get through the first day were arranged on a table by the gate. As I walked outside and turned the corner, kids and parents all waited eagerly to see what was in store. I broke out my camera right away and began to capture the moment. Margarett began to assess the children and grouped them according to their educational capabilities. Each group was color coded, given a sandwich and sent to sit along the curb under the trees. Once the groups were sorted we ran into a dilema of not having enough baskets for each child so we asked the older kids who are scholarship recipients from the Edouarine Alexandre-Vilceus Educational Fund, a fund set up by Margarette and her family, to pay it forward and give their baskets to the younger children who didn’t have. It wasn’t a difficult decision and the older children relinquished their baskets. What an experience and such an amazing sight to see as laughter broke over such a wonderful deed. The older kids were tasked all week to help with the younger campers in an effort to bring a sense of community and responsibility to the future of the area. “Each one teach one” ran through my mind every time I witnessed these kids helping each other. Once everyone was sorted with shirts, baskets, supplies and breakfast we ushered each group into their respective areas for their lessons. After lessons were completed the children were allowed time to play while lunch was prepared. At play time I must’ve seemed to forget my age when I decided to play a little bit of soccer with some of the teenagers, not that my skills were ever in question but my physical condition compounded with the heat didn’t make for much of a long game…And did I mention it was hot!! Yes indeed, a little after 12 noon until about 4p the sun and the heat were relentless! But the kids didn’t seem to mind one bit, they ran and played and jumped and played and ran some more. Anyway, Monday morning was long due to all the formalities but the days that followed fell into the same routine, breakfast, lessons, free play – minus my participation, lunch, a bit of socializing and then dismissal. On the last day of camp I woke a little earlier than normal. You see each morning before I could make it out the door most of the kids were already there so on this day I wanted to be the early bird. So after finishing my morning ritual I grabbed my camera and headed out the gate. I began filming as I once again walked the muddy path around the village, this time walking the full circle back to the cul de sac and down the narrow road that led to the clinic. I wanted to get an all around picture of their everyday life and also a final glimpse at my surroundings. For the last day we planned to take a break from the lessons and allow the kids a bit more free time to color, draw and play. Margarett had a few games lined up for later in the afternoon and a little dancing to close out the day and the week. Within all of that we scheduled the distribution of shoes, some of which we collected at our shoe drives at ComeInUnity and The Brooklyn Museum. Prior to distribution Margarett organized a few rounds of musical chairs which brought some serious energy to the day. All the kids had an opportunity to participate and each and everyone had a blast. Parents and friends peered in through the gates cheering their kids on. The atmosphere was electric! As we laid the shoes out on the table you could feel the excitement in the air as the kids sat in anticipation. Margarett called each child according to their registration date and we fitted close to 60 pairs of feet! What a feeling and what a site to see. Also amazing to see some of these name brand shoes, Nike, Adidas, Reebok, Converse, that many of us yearned for at one point on the feet of deserving people instilling hope, confidence and pride. Most of us within the sneaker community knows that feeling of getting a new pair of kicks so you can imagine how this feeling was multiplied tenfold. Soon after the shoes were distributed and we were surrounded by Happy Feet, the music began to play and everyone joined in on the dancing and festivities. It was another amazing site to see. Everyone from young to old dancing, laughing and having a great time. The night before Margarett and I packed gift bags as a parting gift for the campers. Every camper received a bag with varied gifts in hope that this experience would stay with them throughout their lives. My last day was complete and I was exhausted! The entire week had caught up to me and hit me over the head like a sledge hammer but it was all worth it. We sat down for a few and reminisced over the day and the week and what an experience it was. A few of the parents stopped by to say thank you and that made for a great end to the evening. I had an early flight the next morning and we also had word that things were ramping up for the election on Sunday so it was best if we got to the airport earlier than planned. I did some last minute packing and got to bed. I eagerly woke at 4:30 am and got dressed and we headed out the door. It was pitch black out and for the last time I headed down that bumpy road, on the way back to my reality. On our way to the airport, the night turned to morning and signs of life made its presence along the roadsides. In the towns we drove through people began to make their way to the open markets and Haiti once again came alive. We made it to the airport safely thanks to Pierre, said our goodbyes and went our separate ways. One of the most memorable parts of the experience was hearing the kids laughing and playing every afternoon. Each and every day the yard was with filled with joy and laughter and it warmed my heart to know that we were responsible for providing that experience. As I scrolled through the pictures it was clear to me that we had made a huge impact, not only for the kids but for the entire community. The memories of my experience are vivid and I hope in time they remain so. Missing my family a great deal, I was excited to be heading home but it hit me when I boarded my flight, I was leaving all these kids behind! Haiti was the first independent nation of Latin America and the Caribbean, the second republic successful in a war of independence against a European colonial power in the Americas, the only nation in the western hemisphere to have defeated three European superpowers (Britain, France, and Spain), and the only nation in the world established as a result of a successful slave revolt. With all that being said Haiti has suffered tremendous destruction, devastation and hardships over the decades in which it has still yet to recover. The long lasting effects still resonates throughout the streets and is evident in the faces of those directly affected. Truth is, from my eyes the poverty is on a different level from what I’ve ever seen. 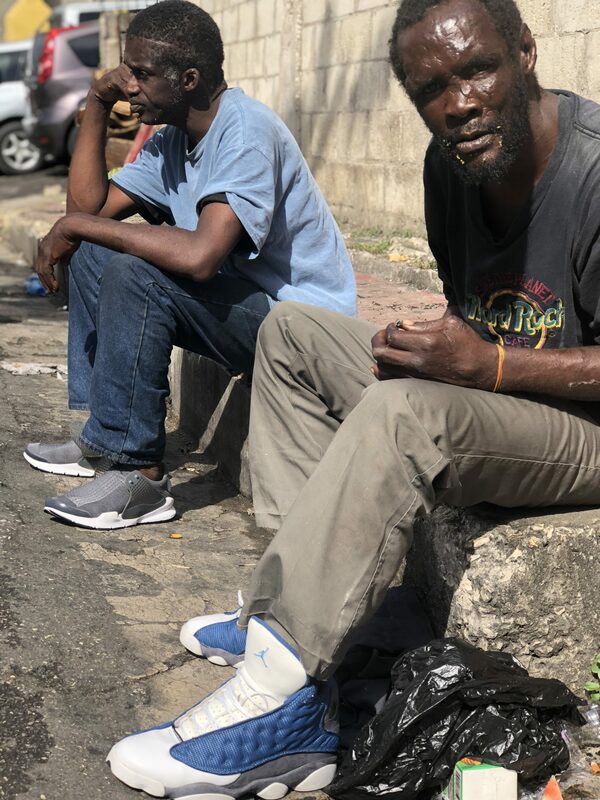 The latest statistics show that approximately 78% of Haitians are poor, living on less than $2 US per day and approximately 54% live in extreme poverty on less than $1 US per day and even more staggering in rural areas the poverty and extreme poverty rates are 84% and 69% respectively. This journey has forever changed me, my outlook and approach on life. I can’t even find the words to express what I’ve been through, it’s just one of the things where you have to actually be there to grasp the enormity. With all that we take for granted, many of us are more blessed than we can even imagine. Without getting into the politics or the bureaucracy, the people of Haiti are in need of some serious support and we along with Margarett and Mission Grandbois are committed to providing that support for the sake of the people. The one thing that puzzled me during my entire trip and still to this day was that with so many organizations present, some being involved in Haiti for decades and with the billions of dollars poured in why hasn’t there been any progress? The entire team at Heeling Soles would like to thank from the bottom of our hearts Margarett Alexandre and Mission Grandbois for allowing us the opportunity to experience your world and having us be a part of such an amazing life altering journey. You can count on our continued support and we look forward to working alongside Mission Grandbois to further the initiative.